It is important to consider your audience when designing an environment. What is their purpose for being within the space? What are their demographics? Their personality? Making these considerations and applying elements of design to them will ultimately form a relatable, memorable and desirable place to be. It is obvious that these steps were taken in the design of the new Thompson Elementary School in Arlington, Mass. 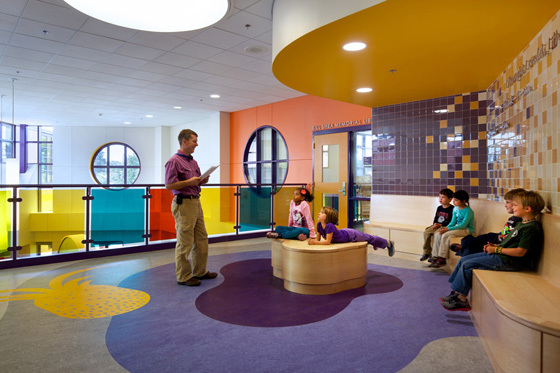 The space, designed by HMFH Architects, captures the pure whimsy that reflects grades K-5 students. 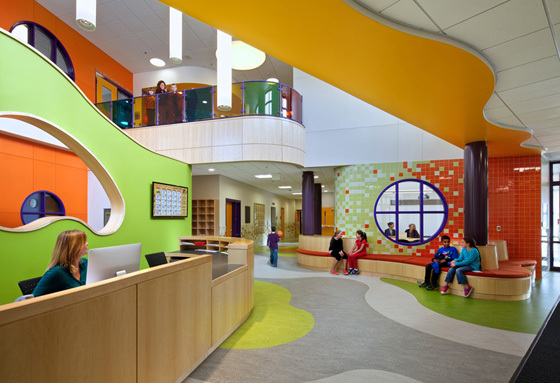 The environment is open, colorful and has a youthful comfort from the outside, in. Continuity within the space took form through the universal pineapple symbol, which represents welcoming and hospitality. While this remained consistent, the colors throughout the school did not. Each floor has a designated color integrated into the tile pattern on the walls and stairway rails. “That kind of thing helps to indicate and remind them that they’re in the right place, or ‘I need to go to the art classroom, and I know that’s on the third floor, and that’s the floor that’s mostly green in it’—whatever tools and tricks that they use to remind themselves of where they’ve been,” explained Lori Cowles, principal at HMFH and project manager for the Thompson Elementary project. This is creative way finding at its best! Thompson Elementary showcases unity from the entrance to the gymnasium. 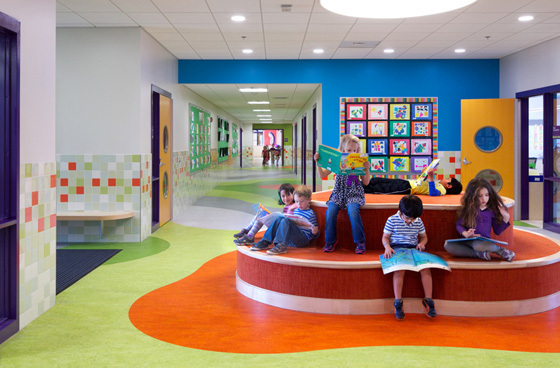 The space was designed to stimulate the youth, through bright colors, ample lighting and openness.